Are you looking for a good Quality English Current Affairs PDF Book? Here, is the best place for you. Current Affairs is the most important subject for any kind of Examination like SSC, wbcs, psc, bank, rail, police, upsc, pcs fci etc. Nowadays high competition for any kind of Government Examination. So you need to better preparation. We give you regularly Study Materials to help better preparation. 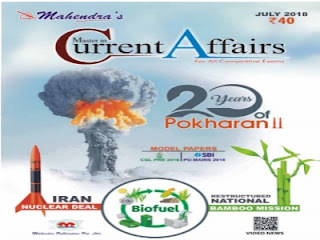 Today we share Mahendra's Current Affairs July 2018 .This Notes Help For Upcoming govt. exam.